The dioceses of the peninsula opened the Holy Doors of the cathedrals. In Daejeon and Suwon, the Holy Year involves the shrines of the martyrs of the anti-Christian persecution. In Seoul a "marathon" of confessions for young people outside of Myeongdong. President of Justice and Peace: "If you are humble, then and only then will the Holy Spirit fill you with His grace." 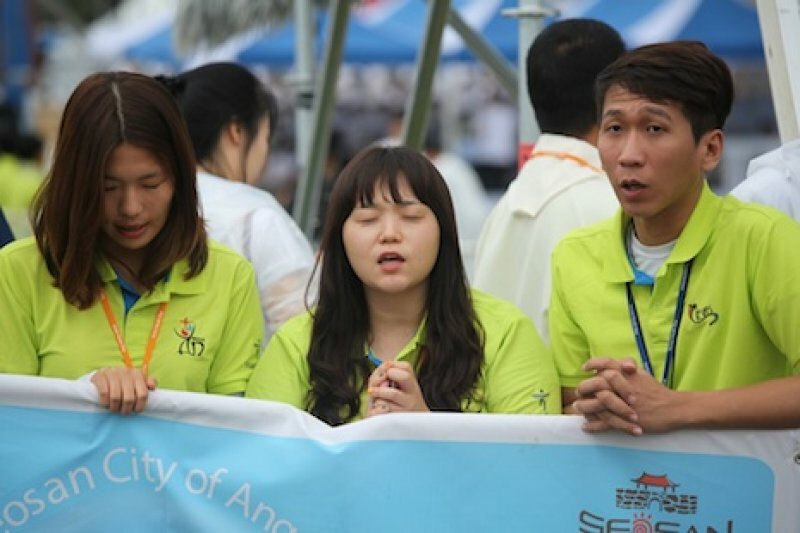 Seoul (AsiaNews) - The Jubilee in South Korea "has three faces: that of the martyrs, the young people and migrants. Through their testimony, we can grow in faith, they must be the first recipients of God's mercy”, says Mgr. Lazzaro You Heung-sik, bishop of Daejeon and president of the Episcopal Commission for Justice and Peace, to mark the start of diocesan Jubilees. The cathedral, dedicated to St. Joseph the Worker, saw the opening of the Holy Door together with those of the rest of the world, last December 13: "The mercy of God is the face of the Church, a criterion of faithfulness to the Lord. And especially for Christians: the world needs forgiveness and reconciliation. I hope that the Jubilee will change Korea. It is a much needed time of grace". Daejeon diocese is the "cradle" of the great Korean martyrs, who gave their lives for the Gospel: "That's why we opened [today ed] three Holy Doors in the special places of their martyrdom. These include Solmoe and Haemi, visited by Pope Francis during his apostolic visit in the summer of 2014. The martyrs are buried here who bribed the guards to be killed on Good Friday and on Easter Sunday. They are examples that we must always keep in our heart ". Another important aspect of the Korean Jubilee concerns migrants. In the Diocese of Suwon, says Fr. Maurizio Giorgianni Omi, "the Committee on Migration has decided to organize a pilgrimage for immigrants, so they can experience the Holy Year. On 7 December, I announced to migrants that we will go on pilgrimage to the martyrs to receive mercy but also to be bearers of mercy toward others. I hope we can make this pilgrimage on Divine Mercy Sunday, the first after Easter. I could not imagine a better date. " Advent, explains Fr. Giorgianni, "is the moment when the mercy of God is close to us. Yesterday some migrants came and they told me that they want to confess this coming Saturday: This is something special for them. The Pope sees farther than us, because today’s world is really in need of gestures of mercy. To give the mercy we recieve". All Koreans, resumes Msgr. You, "are happy with the Pope. We must learn to follow his lead, his words and his attitude, and make them our own. Too often, instead of listening to the words of Francis, we them to judge others. This is wrong. Everyone has their own interpretation of the pope, and that's not good. Christianity is not a religion of ‘individuals’, but teaches a community life in the image of the Trinity. It is a challenge, an adventure". In the capital Seoul, the Holy Door was opened by Card. Andrew Yeom Soo-jung in Myeongdong Cathedral. On February, 23 2016, however, he will open the doors of the Archdiocesan sanctuaries Saenamteo and Seosomun. On the evening of 18 December, 30 large tents will be mounted in front of the mother church to enable young people to go to confession before crossing the Holy Door. Pope: At the Holy Door, Jesus says "Arise!". "With my heart healed I do works of mercy"
Pope: "Mercy cannot remain indifferent in face of the suffering of the oppressed"